All songs by Donovan P. Leitch, except 06 by Buffy Sainte-Marie and 11 by Shawn Phillips. · Donovan: acoustic guitar, harmonica and vocals. · This album is a bootleg release, edited by Patrick Hehir (Donovan's manager from 1983 to 1992), who tried to sell this as an official release. There are many bootleg efforts masquerading as 'official' releases, from which Donovan has not received any royalties, and this is one of them. · Mellow Records recorded many of Donovan's live concerts during the 1980's. 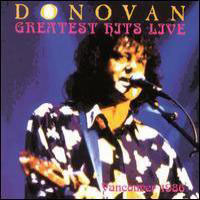 After the release of Rising in November 1990 and the bootleg Rising Again in May 2001, tracks of a concert Donovan gave in Vancouver in 1986 along with some bonus tracks from other live concerts and a demo of his 1980 album Neutronica were assembled and published as Greatest Hits Live: Vancouver 1986, under the label Varèse Sarabande. · On the album, it says three of the bonus tracks were recorded in 1986 in Carnegie Hall, New York City: Sailing Homeward, Mr. Flute Man and Young Girl Blues. But Donovan's voice sounds younger, so it was probably from the 70's. The last bonus track is a demo version of Only To Be Expected from the Neutronica album, which had been already released for the first time a couple of months before as a bonus track for the Pilot Records reissue of the Neutronica album. · Coming from the same time period as the albums Rising and Rising Again, the stories Donovan tells around the songs are recited in a very similar way. The enthusiasm factor he introduces in every story makes it worth listening. · In the introduction of Isle Of Islay, Donovan describes the whole story about the drug bust in 1966. · The instrumentation is sparse, as in many Donovan's concerts: just him with his guitar and harmonica.